Physical activity is extremely important for everyone, but especially for children. A well-designed exercise program enhances the physical and intellectual development of a child. Competitive sports are often a child's first introduction to programmed exercise. In the past decade, there has been an increase in the number of children participating in team and solo sports. Younger children are allowed to participate in sports for enjoyment, health and personal development. However, this changes as competitive elements become more dominant and young athletes train harder and longer, and may practice a sport throughout the whole year. 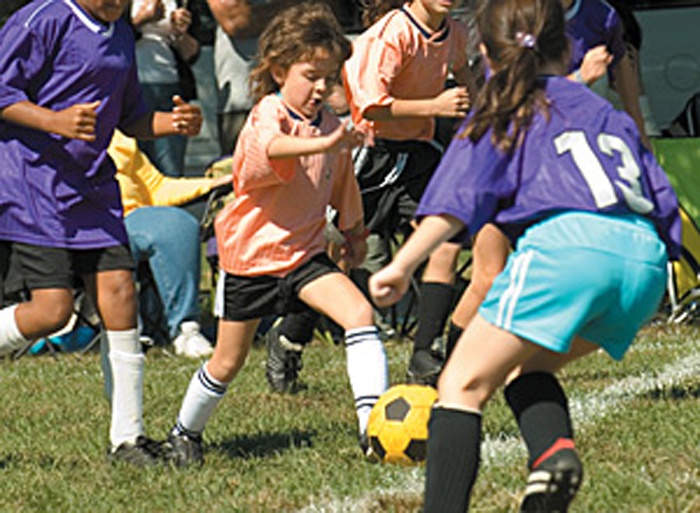 Consequently, sports-related injuries in children have significantly increased. To understand pediatric injuries that can occur during sports performance, it's important to be aware of the peculiarities of the growing musculoskeletal system. Children's tendons and ligaments are relatively stronger than the epiphyseal plate; therefore, with severe trauma the epiphyseal plate will give way before the ligament. However, children's bones and muscles are more elastic and heal faster. At the peak period of adolescent linear growth, the musculoskeletal system is most vulnerable because of imbalances in strength and flexibility and changes in the biomechanical properties of bone. Physiological loading is beneficial for bones, but excessive strains may produce serious injuries to joints. Low-intensity training can stimulate bone growth, but high-intensity training can inhibit it. Growth plate disturbances resulting from sports injuries can result in limb-length discrepancy, angular deformity or altered joint mechanics, possibly causing permanent disabilities. Sports involving contact and jumping have the highest injury levels. Chiropractors have been uniquely trained to understand the musculoskeletal system, making them excellent resources for the management of sports-injuries. We need only to make certain we are aware of the peculiarities of the pediatric musculoskeletal system when pursuing appropriate evaluation and case management. Widening occurs on the surface, appositional bone growth; longitudinal growth occurs at the ends of the bone at the epiphyseal plate. The cartilage matrix grows by interstitial expansion, once growth has occurred the cartilage matrix degenerates and is replaced by new bone in the metaphysis. In the metaphysis, the new bone is weaker with a thinner cortex. Remodeling occurs until a rigid stress-resistant structure is produced in the central portion, the diaphysis. Growing bone has inherent areas of weakness due to these processes. Because the epiphyseal plate allows for extension, it has less resistance to both sheering and tensile forces than the adjacent bone. The thin cortices of the metaphysis also have less resistance to compressive forces than the adjacent thicker cortices of the diaphysis. The patterns of injuries to growing bone are different than mature bone because of their unique biomechanical characteristics. Two main types of injuries occur, one caused by acute, violent forces applied one time; the other caused by chronic, recurring stress applied over a prolonged period of time. Acute violent injuries can be classified as follows: plastic deformation, torus fractures, green-stick fractures, epiphyseal plate injuries ( Salter-Harris classification), and apophyseal avulsions. Chronic recurring stresses include the overuse syndromes, stress fractures and apophyseal injuries involving the patella (Sinding-Larson), tibial tubercle (Osgood-Schlatter's) and the Achilles, as in Seiver's; all with a similar mechanism. Let's review the conditions that preclude children from participating in contact sports, specifically children with developmental issues or handicaps who are involved in activities such as Special Olympics. Children with disabilities should participate in sports if at all possible, but there are a few structural problems that should not be ignored. Children who have been diagnosed with Down syndrome, rheumatoid arthritis, odontoid anomalies, atlanto-occipital fusion, or Klippel-Feil syndrome must be carefully evaluated. Down syndrome patients have a high incidence of atlanto-axial instability, reportedly up to 30 percent. Up to 16 percent of Down syndrome patients who have such instability develop neurologic signs and symptoms. The Special Olympics has imposed a temporary restriction on select activities for Down syndrome participants until a lateral neck radiograph shows no C-1 instability. The American Academy of Pediatrics initially supported this requisite, but changed its position in 1995, stating that plain film radiographs were "of potential but unproven value in detecting patients at risk for developing spinal cord injury during sports participation." The controversy arises from the fact that some Down syndrome patients can initially have abnormal radiographs, but follow-up films can be normal; and some patients have normal radiographs that eventually become abnormal as they age. It is my opinion that children with an increased ADI (over 3 mm) should be evaluated radiographically for instability. Cervical spine injuries in children usually occur in the upper cervical spine from the occiput to C3. The fulcrum of motion in the cervical spine in children is at the C2-C3 level; in the adult cervical spine, the fulcrum is at the C5-C6 level. The immature spine is hypermobile because of ligamentous laxity, shallow and angled facet joints, underdeveloped spinous processes, and physiologic anterior wedging of vertebral bodies, all of which contribute to high torque and shear forces acting on the C1-C2 region. Incomplete ossification of the odontoid process, a relatively large head, and weak neck muscles are other factors that predispose to instability of the pediatric cervical spine. The neurological manifestations of atlantoaxial instability include neck pain, gait disturbances, decreased cervical mobility, torticollis, incoordination, spasticity, hyperreflexia, and clonus. If any of these symptoms is present, the patient should be further worked up with an MRI prior to participation in any sports. Down syndrome patients with atlantoaxial instability should be restricted from certain sports, including gymnastics, diving, the pentathlon, the butterfly swimming stroke, high jump, soccer, and neck stretching warm-ups, as well as from contact sports like football, wrestling and rugby. Patients with rheumatoid arthritis are also at increased risk for spinal cord injury in contact sports because of an increased incidence of cervical instability. Cervical subluxation can be found in 15 percent of RA patients within three years of diagnosis, and 17 percent of RA patients who have radiographic abnormalities have neurological symptoms. Thus, careful attention should be made when evaluating the cervical spine in patients with rheumatoid arthritis, especially atlantoaxial instability. The congenital abnormalities of odontoid agenesis, odontoid hypoplasia, and os odontoideum are all contraindications to participation in contact sports, as is atlanto-occipital fusion representing partial or complete fusion of the bony ring of the atlas to the occiput. The Klippel-Feil anomaly refers to congenital fusion of two or more vertebrae, of which there are two types. Type I is a mass fusion between the cervical and upper thoracic vertebrae. Type II represents a fusion over one or two interspaces. The more segments involved, the greater the loss of motion and the greater the stresses on adjacent normal segments. The ability of the cervical spine to absorb and dissipate loads is clearly diminished with long fusion masses. A type I lesion constitutes an absolute contraindication to participation in contact sports because of the marked alteration in spinal mechanics potentially predisposing the athlete to injury or degenerative changes. However, a type II lesion, involving fusion of one or two interspaces at C3 and below, should present no contraindication to sports for an individual with full cervical ROM and an absence of occipital cervical anomalies, instability, disc disease or degenerative changes.